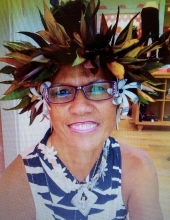 Maria Kekaikuihala Kelley (Kalama) Davis, also known as “Mama Kahu” unexpectedly passed on March 28, 2019 at the age of 64. “Mama Kahu” is survived by her husband, Kahu Wendell Davis and three children; sons, Ka’aumoana (Amanda, grandson, Malachi) Davis, Kaehukaiopalemano Davis and daughter, Puakailima Davis. She is also survived by three siblings; brother, Chester Kalama and sisters, Cynthia (James) Sharp and Ruby Kalama. “Mama Kahu” was born on November 2, 1955 to her parents, Noah and Ruby Kalama in Honolulu, Hawai’i and graduated from Roosevelt High School in 1973. In the previous year of 1972, she met her husband at Kawaiaha’o Church and married in 1979. Throughout her life, she touched many lives as she faithfully served alongside him in ministry over a span of twenty years at Kahikolu Congregational Church, Kamehameha Schools – Hawai’i Campus, Kalihi & Moanalua Congregational Church, Kaneohe Congregational Church, Kamehameha Schools Bishop Memorial Chapel and Mid Pacific. She was also a member of the Daughters of Hawai’i and served as a docent at the Queen Emma Summer Palace. “Mama Kahu” was a gifted singer, instrumentalist, and talented hula dancer and teacher, responsible for organizing the Christian Hula Halau, “Ho’omana Ke Akua” in both Kona and Kaneohe. She was a prolific youth leader in the church and operated her own entertainment booking agency, Gold-to-Gold Productions. “Mama Kahu” will be sorely missed. She was one of the most vibrant, energetic and pulsating person you could ever meet, but, most of all, was a faithful and godly woman. A Celebration of Life service has been planned for Friday, April 12, 2019 at Kawaiaha’o Church. Visitation begins at 5pm, followed, by a 7pm memorial service. Private Burial. Aloha attire. To send flowers or a remembrance gift to the family of Maria K.K. Davis, please visit our Tribute Store. "Email Address" would like to share the life celebration of Maria K.K. Davis. Click on the "link" to go to share a favorite memory or leave a condolence message for the family.